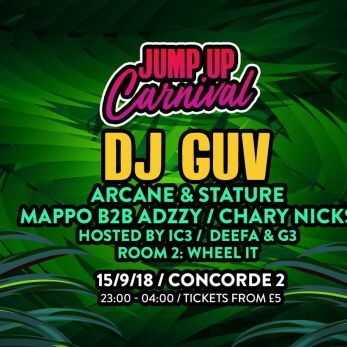 DJ GUV'S JUMP UP CARNIVAL! Jump-up drum and bass has seen a surge in popularity amongst ravers in recent years with its unique style incorporating heavy bass sounds and robotic synth patterns proving a hit with fans, and one of the many producers and pioneers behind its success is DJ Guv, a music visionary that continues to push the boundaries of this niche genre with his creativity and passion for the dance music industry. In 2016 his ground breaking track ‘Warning’ won him ‘Song of the Year’, which has also gone on to receive status as one of the most recognisable drum and bass anthems of all time. For the first time we bring the Jump Up Carnival to Brighton for the beginning of Fresher’s week. With Guv heading up the bill we will be joined by a wealth of talent including some of the finest local talent on offer. This one is gonna go OFF!